What can a person say about cat scans other than they are feline fotocopies! No, that is incorrect as they are felines that have been scanned by a scanning device. Although they look like color photocopies. Rather than putting a sheet of paper in a scanner you put your cat on the scanner. You don’t try and close the lid because that won’t work. 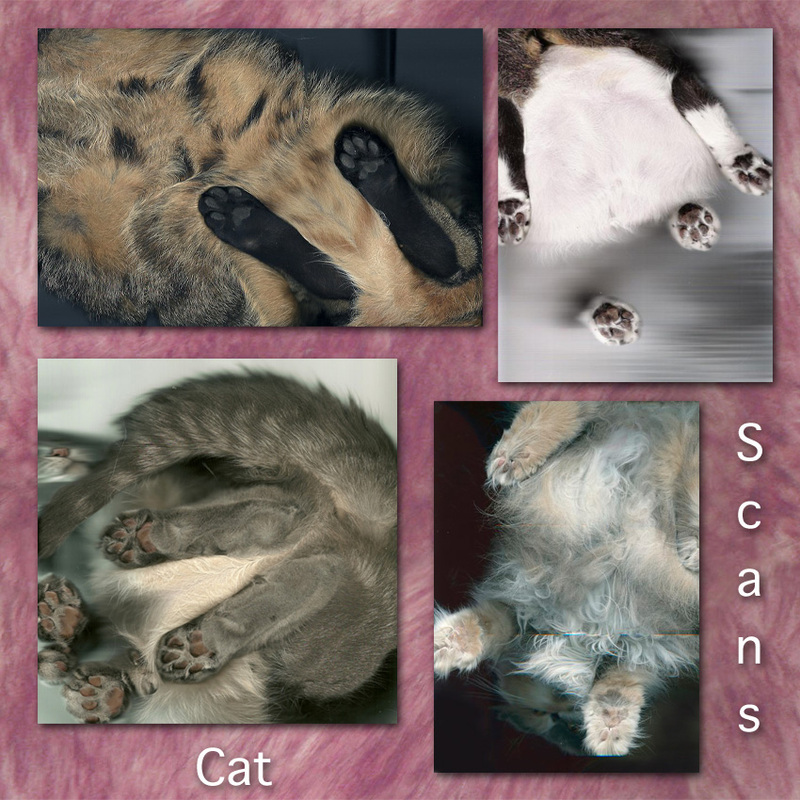 You just push or click the scan button and hey presto you have pictures of cat scans like these below. By the way I am guessing that is what you do because I have never done it, I am pleased to say. If I am wrong please tell me. Cat Scans. Credits: top left: by heatherpalmer-, top right by judgedbyitscover, bottom left by celia, bottom right by monsthings. I suppose one limitation is that you almost always get one viewpoint or angle: the feet and belly. A particularly pliable and accommodating cat might lie down on his side which would provide a nice variation. What a relief. What you do get is an interesting abstract pattern of feet and fur. The fur provides a nice texture. I have to say that cat scans seem to be a desperate attempt at creating something new along the lines of the cheeseburger, funny cat cat picture. “How can we get a picture of a cat that looks different, guys?” “Ah, I know, we scan a cat”, someone replied. I am not going to get all grumpy over this genre of cat image. I’ll just say that although I quite like the images, I positively do not like the way they were created. Although, I am sure a cat won’t mind much. One or two might get a bit twitchy when the scanning light tracks across their belly. I just don’t like the idea of using the domestic cat all the time to create images as a source of amusement. Please can we change the subject matter? The age of the funny cat picture, other than proper ones that provide information is over or it should be. What about these cats? Well the first three are tabbies, one being tabby and white. The cat bottom right seems as though she could be a calico semi-long haired cat. They all seem to be moggies. I am probably wrong on the last one. I’d like to briefly thank Marc for bringing the cat scan to my attention. I don’t have anything more to say about them. Perhaps someone can leave an enlightening comment. This entry was posted in Cat Anatomy, Cat photography, Cat Products, Pictures of Cats and tagged cat scans, catscans, photocopy of a cat, pictures of cats by Michael Broad. Bookmark the permalink. Well said Michael, wipe out the homelessness and abuse and killing of cats and show them respect, then think about having fun. I’m sure our cats would look at me with disdain if I tried, they would jump off and have a thorough wash to show their displeasure at being womanhandled. Wasn’t there a spate of people being reported not so long ago for having their cat a facebook page? I must admit to having a cat friend on there because for the first 100 friends he got he donated £50 to Kays Hill Cattery our local Sanctuary, for cat food. Then another £50 for another 100 friends. Having a cat page for education and for helping charities is good. Oh yes the 1960s and the 1970s were good Michael, I was young enough to physically help animals those days but now I can’t do as much that way the internet is great for on-line education so I wouldn’t want to go back to those times. I can cry for the 60s sometimes (after a glass of wine and some music ;)). I can’t be sure but I sense that the world is going in the wrong direction and the lolcat cult and derivatives is one tiny symptom of that drift in the wrong direction. I’d like a more serious attempt to help cat welfare first before we use the cat for our amusement. Let’s get serious about cats and making their lives better (there is lots to do) and spend less time chasing quick and easy pleasures based on the cat. When cats are treated really well and when there are no unwanted cats – none – then we can settle down and have a laugh at a silly cat pic with a silly caption. I don’t drink and I listen to electronic music 🙂 – but when I was a teenager I loved the music fo the 60’s. But going out in London in the early nineties you couldn’t avoid the whole electronic thing. Yet I thought it sounded fairly repulsive before that. Funny how things change over time. A Ford Capri actually looks pretty cool now. I’m serious. It’s good to have our own opinion on ‘grey areas’ Marc, it would be wrong and very boring if we were all yes men/women and didn’t voice our own thoughts. If a cat chooses to do something himself it’s far different to being forced to if he doesn’t want to, just for peoples amusement. Thanks for the support Ruth. I hope they are not being forced, I don’t really think a cat being forced would stay still enough to complete a scan anyway. I’ll be honest – I like them and don’t mind them really. I don’t think they are particularly harmless. The overriding fact that cats are being used as creative objects in this day and age is just that, a fact, for better of for worse. I wonder how it affects cat welfare. Personally I don’t think that people who scan their cats are cruel to their cats. More likely they love their cats. Life is not perfect, or is it actually – anyhow, I will put money on the fact that these cats were not bothered, I know mine would be all over a scanner if they could get the lid open. Lilly would for sure sit on it because its a bit warm and I wouldn’t then be able to scan paper for the next few hours. Michael is right, life is more complicated and that is largly because the internet and computers are a very large part of it. I think they are good, so I accept that there will be bad things that come with it. This isn’t so bad. It could be – one could imagine people forcing their cats to be scanned in horrible ways but I just doubt it– certainly for the ones who are sitting or lying down. If I had a scanner I might have no choice but to do it because I know my cats. Cats are the center of attention, is this the problem? Was cat welfare better when nobody payed any attention to them? I doubt that. I am sure that since the cat craze started shelters have noticed a difference of greater attention to cats whatever that may mean. I think if they are forgotten they are not protected. When I had my first cat I loved her more than anything but I didn’t take care of her as well as I would now. But I had to learn. I might have found more locat type stuff funny back then because I was less sensitive to her in ways I would be now but I loved her and would never make her unhappy on purpose. People, and especially young people, have to learn. It is frustrating as an older person to see how imperfectly they treat subject matter but is it better that the cats are just forgotten? Honestly? I bet more people know about mass killing of cats just because cats are popular on the internet. They need to know about it don’t they? I have seen people talking about the terrors of declawing on lolcats. I’m sure others read it and learned something. Where and when is the forum for people to learn? Can they learn without ever making mistakes? I’m getting pretty rhetorical here – sorry about that. But seriously, would the cats be better off being forgotten in the popular cultural world? I am only 35 – perhaps thats why I’m the one who’s saying this. I don’t think I am stupid or totally wrong and I do think I have really thought an awful lot about all this stuff. I feel the same frustration towards the same things as all of you but I guess I have a bit more room n my heart for the fact that it’s here and it is a fact of life and cats were probably not better off before and I can say with absolute certainty from trawling comments and making comments of complaint myself with certain things – that more people are aware of the plight and cruel injustices that cats must often confront – the horrors of the ‘shelter’ and survival as a stray or abandoned cat. I never bought my first cat a single toy, nor cat tree and let her outside with impunity but it got me to where I am now. The internet is the internet – it’s an amplifier of good and bad – but it does mean not only the rich and famous control the world and I wouldn’t change that for the world. I apologize for being a stick in the mud about this but I don’t mind if you guys shout at me and tell me I’m wrong. Maybe I am missing something or I am too concerned about how I am looking at it and in turn not seeing it or something like that. I agree with you. I always do 😉 I think the point is that liking or disliking lolcat stuff and derivatives is a personal choice and it is really for younger people. I don’t hate it. I even get some enjoyment out of it sometimes. I just feel enough it enough. I’m more bored with it probably because I have more of it than most people. Also I am not sure about the ethics of “using” the cat in such a massive way on the internet when that energy could be used to really change the culture of shelter mass killing of unwanted cats. For me it’s about using energy. There is a true commitment to creating LoLcat pictures and captions and derivatives yet these people could, and I say really should, also give something back to the cat world by saving some cats, one of the millions of healthy cats killed in “shelters” in the USA. On the one hand we get fun from the cat and on the other hand we deliberately kill the cat. Is that moral or ethical? Are these two aspects of the cat world linked by the same attitudes of people? I wouldn’t be suprised if cats are saved directly as a result of lolcats. I’ve heard plenty of healthy comments on lolcats about cat welfare and I can safely say there’s plenty of people on there who complain if it doesn’t look quite right. Perhaps not enough. In my opinion the whole cat obsession will lead to better cat welfare. Certainly more than no cat obsession. Lets hope energy is wasted less in the future. The way that we can see what their paws look like when their weight is applied is kinda cool. Otherwise… first time hearing about this. Weird. You think the sounds/bright lights of the scanning would scare the cat off the machine mid-scan. I agree with Dorothy, I like the unique view, but am curious to see how big this new fad will get. I keep finding people that add beret to their cats pix for an avatar on Twitter now. Very, very tired of it. These are people that act as if they are their cats. Some have an account for each cat and boyfriend/girlfriend cats send each others gifts. They have parties each weekend (on twitter). Just a weird way to associate with each other. This is the type of person that would love this type of thing. Any reason to share a photo. As far as the lol-cat crowd. They’d add the captions to someone else’s photos. I don’t see them being proactive enough to actually take the picture. Strange what people do these days, isn’t it? Very strange. I actually get quite nostalgic for the days before the internet and the lol cat fetish. What was it like for a cat in those days? I have almost forgotten. I was watching a biopic of the singer Glenn Campbell on TV the other day and it made quite tearful. At that moment I longed for the 1960s and 1970s. It was so much simpler then. Dan, you are clearly familiar with the cat Blogosphere – I agree that some parts are strange and the twiter parties are on the sharp edge of that strangeness but I personally dont mind it at all. I think if people aren’t hurting anyone or anything then it’s silly to be bothered by it. The scans certainly get me wanting to scratch some belly! I like the different perspective of their cute little bodies and fur. Though I agree, what is the point!? I’d say more but I must go scratch a belly or two.